Whether you own a new, safe Galaxy Note 7 or are holding onto the bomb-in-waiting version that was recalled, Verizon has an update for you this morning as software version VRS2APHE. The update serves two purposes, really, to turn the battery indicator green if you have a safe phone or to splash warnings all over the phone should you have a potentially unsafe version. We knew this update was coming, we just didn’t know that the update would place a warning on older phones, reminding their owners that they had a ticking time bomb in their jean pocket. Should you receive the update and already have a brand new, safe phone (stock expected “no later” than September 21), you will now see green battery indicators in the status bar, on the Always On display, and in the power menu as you attempt to turn the phone off. 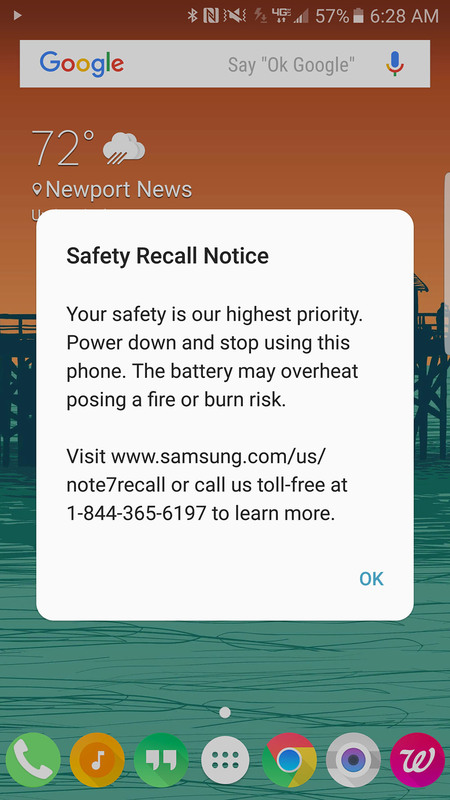 Should you receive the update on the recalled Galaxy Note 7, you will now be welcomed by a “Safety Recall Notice” every time you reboot your phone or plug it in to charge. A reader of ours also mentions that he was able to charge past 60%, despite reports suggesting that Samsung may limit charges. To check for the update, which should be live now, head into Settings>System updates. Cheers Ryan, Paul, and JustinV!